Carmen Bedford — Laguna Beach Live! Carmen Bradford, who has been compared to Ella Fitzgerald, regularly performs in both big band and intimate settings and is professor in jazz studies at the University of Southern California. Ms. Bradford studied classical music at Huston-Tillotson College in Austin, TX. 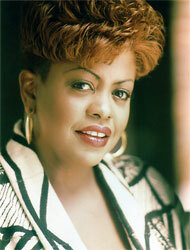 She has worked on performance and recording projects with the likes of James Brown, Lou Rawls, Willie Nelson, Lena Horne, Tony Bennett, Joe Williams, Nancy Wilson and Herbie Hancock. In the early eighties, Ms. Bradford worked as the vocalist for Count Basie’s world-renowned Orchestra. After touring with Count Basie for nine years and performing on two of his Grammy award-winning albums, Ms. Bradford embarked on a critically acclaimed solo career, including the albums Finally Yours (Amazing Records) and With Respect (Evidence Records). She also performed on George Benson’s recording, Big Boss Band, and contributed tracks to The Benny Carter Songbook, both Grammy award-winning albums.